Joe Koenig – a wordsmith and investigator who knows how to tell truth from deception. Born and raised in the Kalamazoo, MI, Joe went to Kalamazoo University High on the campus at Western Michigan University. U-High closed in 1967. He was very active in sports and wasted a good deal of time and energy thinking he was good enough to play professionally. In 1967 he luckily joined the Michigan State Police and, in 1971 married the love of his life, Julie. Marriage put him on track and he began to realize that time moved even if he didn’t. He became driven to learn and build, creating a wonderful family, and earning two college degrees. In 1993, after 26 years, he retired from the Michigan State Police (If you are interested in law enforcement, there is none better). In 2004 he retired again from Hartford Financial and relocated in Grand Rapids. 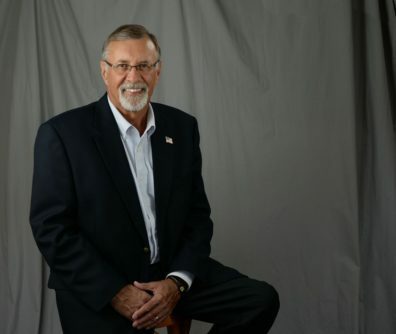 In 2005, he founded his firm KMI Investigations, LLC where he focuses on financial investigations and speaking engagements on ‘Getting the Truth’ and the ‘Truth in Ethics’. I was a voracious reader and a wordsmith. At an early age, I assiduously looked up any word I didn’t know which greatly slowed my reading rate but gave me a love for the precision and subtlety of words. Over the years I gained an intimate and revealing understanding of the importance of words, the role words play in communication, and how people use the subtleties of words to their advantage. I start by generating ideas and putting those ideas on paper. Then I organize those ideas and create an outline. I study that outline and add ideas as necessary and use that outline to help write my book. I rewrite and rewrite until I’ve sculpted the message I want. John LeCarre, Joseph Wambaugh, Larry McMurtry, John Grisham, and Tom Clancy. Joseph Wambaugh, Larry McMurtry, and Tom Clancy. I have a dozen books by fellow Michigan authors that I am reading. What writing projects do you have planned next? I may try my hand at fiction, with a “Mentalist” type main character who uses the principles in my book to help solve mysteries. I may also write a book on how ethical decision-making is so dependent on facts and truth-gathering. Getting the Truth is about understanding the real message, distinguishing truth from deception, and learning how to sculpt question s to get the truth. It contains many real-life and well-known examples that drive home the principles for the reader. It is available at any reputable bookstore and through Amazon. 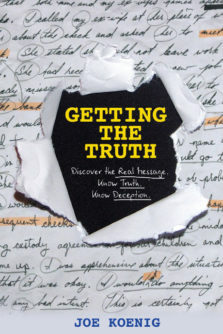 Getting the Truth reflects Joe’s passion for knowing and teaching people what really goes on around us.